Previously known as “Do It in the Dark”, is an energy competition sponsored by UCLA Office of Residential Life and UCLA Housing & Hospitality Services, and promoted by ORL’s Team Green that educates and encourages residents on the Hill to decrease their electricity usage. Each building’s electricity usage baseline is established in January, and residents compete for the month of February to reduce electricity compared to the previous month. Buildings with the greatest reduction win money towards a sustainable party fund. Residents are also encouraged to pledge to save energy, and the building with the greatest percent of pledges also wins money. Participate in Energy Games 2018! UCLA’s 9th Annual energy savings competition was a huge success. Together we saved 226,000 kWh of electricity or 185 tons of carbon dioxide emissions! That’s how much the average car emits over 400,000 miles (the distance you would travel if you circled the earth 16 times)! Over 2,500 students (25% of students on the Hill) pledged to reduce their energy consumption during UCLA’s 8th Annual energy savings competition. Together we saved 119,000 kWh of electricity or 82 tons of carbon dioxide emissions! The amount of energy saved could’ve powered 15 homes in Los Angeles for a YEAR! This annual event not only involved UCLA students, but all UC’s were competing in the Campus Conservation Nationals competition, over 175 colleges participated! With over 3,500 students participating, 58,528 kWh of energy was saved during this one month competition! 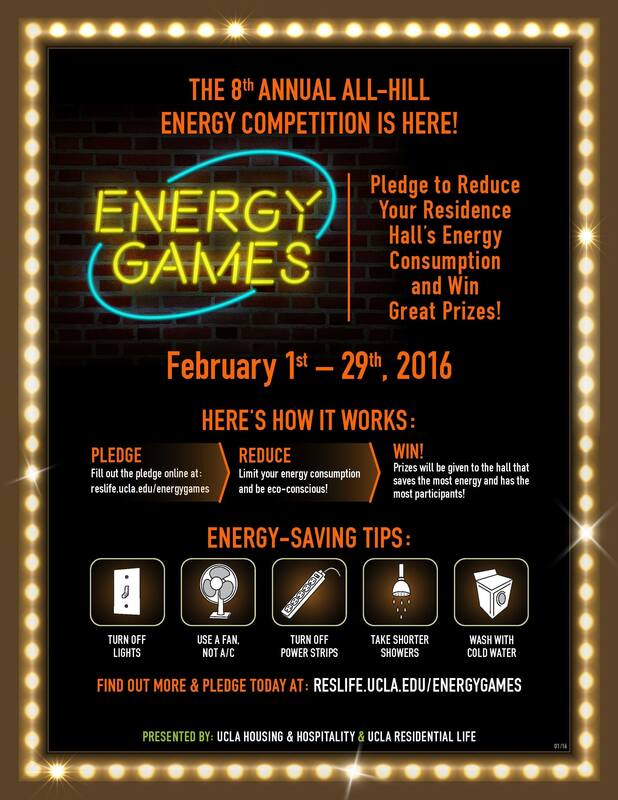 Over 4,350 students (or nearly 40% of the Hill) pledged to reduce their energy consumption during UCLA’s 6th annual Residence Hall energy savings competition. Together an estimated 234,000 kilowatt-hours (kWh) of electricity were saved for the month of February. The carbon emissions reduced from the competition is equivalent to the same amount of carbon sequestered by 135 acres of U.S. forests in one year (EPA Equivalencies Calculator)! Keep on saving! Learn more about how you can reduce your electricity use here. Over 3,100 students—29% of the Hill—pledged to help reduce their buildings’ energy use by 10% and together an estimated 20,490 kilowatt-hours (kWh) of electricity were saved for the month of February. The electricity saved in February is equivalent to the energy needed to run 475 60-watt light bulbs continuously for an entire month!